A Blog with substance tag | Memorable Days : Beauty Blog - Korean Beauty, European, American Product Reviews. Yeahhh, I got tagged by Lene from Everythingism ;). 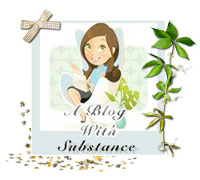 It's called a blog with substance tag. 3. Give the award to other bloggers with substance. HAHA I love your blog philosophy! I will do this tag once I finish studying for my last final. Thank you ^_^! I feel so honored :D! Thanks for visitignand commenting on my blog!